Have you ordered your Letters to Santa yet? Check out the post here………and order your own set! I love getting new books for the kiddos. Especially when they’re brand-spankin’-new and have that fresh paper/glue smell to them. Mmmm. And it’s secretly my selfish way of getting the little monkeys to come settle down and cozy up in my lap. What could be better? So this year for Christmas, I bought both my little girl and boy a few new books each, that I thought they would love. And then I wanted to make something to accompany their gift of books. First up? My little girl. So I purchased a few books (one more on the way) for my little lady. I just know she’ll love them. And to go along with the books, a few gaudy accessories. You know, extra shiny, fluffy, and glittery. Because that’s what Fancy Nancy would wear. It’s not about a theme with Fancy Nancy. Or matching. Or any sort of sense at all. Just big, beautiful fanciness. That’s it. Books are always a treasure to receive……but adding your own little homemade touch, somehow makes it that more special. Go on, add a little something to your child’s favorite book collection. What sort of fancy accessories did I make? Well, I took some inexpensive dress-up shoes….pulled the plastic butterflies off……..
Then, I wanted to create some little rings to wear. So I stitched some thin elastic together into the perfect ring size……..
Next up, a shiny glass bead necklace. I’m pretty sure there’s something extra fancy about using glass beads instead of plastic! And then I added a chunky bow right at the top. Done. Then I created a very simple cape for her to wear. I cut out a large rectangle, gathered up the top, sewed it to a strip of ribbon…………. ………then added velcro to each end of the ribbon. And because Fancy Nancy loves accessories, I added some big fluffy flowers to the front of the cape. Don’t worry, you can still open/close the cape. It sure make the perfect cape to wear over ball gowns and pettiskirts. Oooooh, and of course we needed a bracelet. A nice frilly one that looks lovely on those dainty wrists. I took a strip of wide ribbon and sewed a piece of thin elastic onto the back. But while sewing, I stretched out the elastic as far as it would pull, continued sewing, and then once I let go of the elastic, it gathered the ribbon right in. Then I sewed the 2 ends together and then sewed the loose ends down. Then I made a flower out of another color of ribbon (flower tutorial here) and then glued it right over this seam. That’s it. Lastly, a bright and floofy headband. Or crown of flowers. Whatever suits her fancy. And that’s the Fancy Nancy Accessory Collection thus far. It can always be added to or altered. Especially if she sees something in the book that she’s like to wear. Just remember that most things can me created from scraps and sparkles that you already have in the house. His and Her Aprons.......Last Minute Gift Idea?? « Silhouette Winner…….plus, CYBER MONDAY DEAL!!!! Great idea! I know a couple of 6 year old girls that would just love to get that as a gift. So stinkin' FANCY! I love the Fancy Nancy books! My daughter is still a bit young for them…18 months, but I have already started to collect them to give to her in the future. I will definitely start adding accessories to the pile! Thanks for the inspiration! Fabulous idea for accessories. They look so POSH! Please visit my blog to see what I did for my grand daughters a few years ago. This is such a fantastic idea!! I wish I would have thought of it! My littlest sweetie is getting the Fancy Nancy doll for Christmas and it might be fun to make her some accessories that are similar to hers. Thanks SO much for the idea! Truly a gift made with love! what a lucky little girl! How precious! My niece loves Fancy Nancy, and I would enjoy making some of these exquisite (that's a fancy word for fancy) accessories for her! Thanks for the adorable idea! My daughter loves fancy nancy books! what a fun idea. this year we made her room fancy, and we also had a posh tea party for her birthday. i love how mismatched nancy is and how DIY her stuff is. Okay, that's ridiculously brilliant and adorable! You go, momma! love this idea of personalizing book gifts! I love it! I made a bunny to go with my daughter's Knufflebunny 2 book. I'm still looking for a tutorial or pattern on how to make a llama for my son's book! Great idea! My girl loves Fancy Nancy! I LOVE this! And, my girls all love Fancy Nancy! 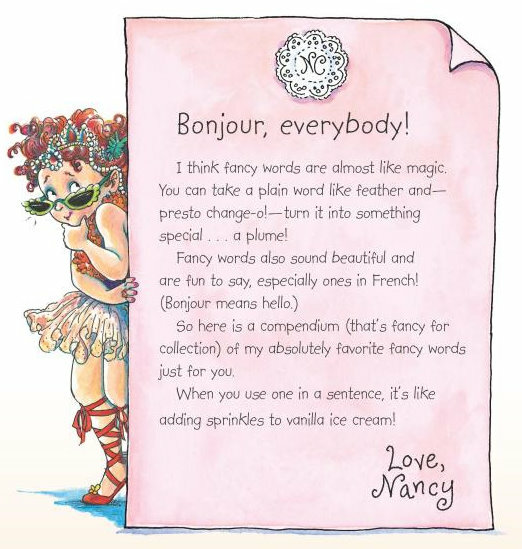 We LOVE Fancy Nancy! Those are fabulous accessories! Thanks for the great ideas. LOVE!!! I'm using Fancy Nancy as the theme for my daughter's birthday in January. These will be perfect for party favors! SO great!! Introducing Fancy Nancy to my daughter this Christmas! Will have to throw in some creative perfectly fancy things to go along with the books!! "OOh! Fancy Fancy [meaning Fancy Nancy]! Mommy, I want that, and that, and that, and that and…" etc. Thanks for the fun idea, I know grandma got her some Fancy Nancy books for Christmas, this would be a good addition! WHY isn't this post from a week ago :) We are having a Fancy Birthday and some of these ideas would have been perfect… guess we will just have to make it a Fancy Christmas for the Birthday girl! What a fun idea! I was just going to get my daughter dress ups for Christmas, but this is so much more fun! You did a great job in capturing the spirit of Fancy Nancy. Sweet!! What a talent you have.=) and so fun. Such a cute idea. We are doing a book draw this year for Christmas and I decided I will copy you and do this for my nieces. Can you post the boy one tomorrow? Can't wait for it! Adorable! And, so fancy! My little girl is drooling over my shoulder. my daughter too, loves Fancy Nancy. What a great idea. Love those shoes! What a great idea! I love gift sets to go with books! I know you probably don't get around to reading all of these comments, but I just have to say, Ashley, that you truly are an inspiration. I found your blog while Googling for a way to make my dress longer and became hooked! If a mom of 2 (and a half!) can find time to create such beautiful crafts and ideas, then I definitely can. Plus, you've given me a practical way to use my artsy side. Thanks so much for sharing your artistic journey with us! Great gift idea! Very age appropriate!where do you get those glass beads from?I am looking for an inexpensive supplier for my fifth grader who is into jewelery making. My granddaughter is just learning to read, so I think she may be a couple years away from Fancy Nancy, but I really have something to look forward too! Just lovely! That's the cutest idea EVER! I would love to make this for a little girl! I have 3 boys, but maybe one of my friends little girls would love this as much as I do! I love gift packages! and ohhhh the crack and feeling of a new book! We are big fans of Fancy Nancy at our house too :)Love all your accessories, awesome job. I'm going to have that bracelet, super cute! Thanks for the ideas! Have to make that bracelet, that is. Oops!! Love your pretty and creative gift set! We did a Fancy Nancy tea party with guests all dressed up. Last year for Christmas I did like you but with a vintage Fairies book and tutu, headband, wings, wand, slippers and even a matching muslin doll. Everything had bells n flowers sewn everywhere. For my son I made costume to go with book, Where The Wild Things Are. All in my life before blogging. (Tho I find I have too much life n too little blogging time this year too.) Thanks for more fun inspiration! That is so cute! I want to make it for my 4 year old for Christmas. Would you mind telling me the dimensions of the cape rectangle and the ribbon on the cape. I know she will be suspicious if I measure her. Thanks! she hasn't read any of the Fancy Nancy books! Hmmmm. Anyways, I stumbled onto this cute page before the Santa request and almost had a heart attack when I thought I lost it. Time is a-running out, have to craft, craft, craft! I bet she will love the set + books if I can find it here. and hopefully miss that Santa didn't bring a turtle. Thanks for helping "Santa" out!